It started back in the early 50s when I was in the fourth grade. My dad decided that he would go into the strawberry business. He thought that it would be profitable and would bring in some much needed money for our family. Not only did he have the space and the know-how to plant the seedlings and bring them to life, but he also had the extra hands to help him with the task. Those extra hands would belong to me and my siblings. He picked out a prime spot on our little mountain side farm and prepared if for planting, naturally with our help. I don't recall actually helping to do any of the prep work with the soil, the planting, weeding, and care of those tender plants but somehow they survived. The first year is never great for strawberries but the second year found us working hard at picking the nice red ripe fruit every other day. Most of those strawberries were four our personal use and we really enjoyed them. After working all morning in the blazing sun on our hands and knees, picking the fruit from those verdant green plants, one would think the last thing on our minds would be eating that fruit. But, knowing that Mom was in the kitchen baking an old fashioned strawberry pie for lunch would make our mouths water. These pies were not like the pies of today with their glaze and piled high with whipped topping. Her pies were made with sweetened cooked strawberries thickened with a flour mixture and poured into a handmade baked shell. They contained no topping and we never asked for a topping because in those days, we didn't know that anything of that sort existed. We accepted what we had and were thankful for it. By the third year, Dad's strawberries were producing in abundance. We started letting other people know that we had an excess amount of strawberries and that we would be willing to sell some of them. So, off we went to the fields early in the morning to pick the fruit. We had attained gallon buckets over the past two years in anticipation of this day. These buckets were most likely gallon lard cans or anything of that sort. Each of us would carry a bucket along and we would take what my Dad called a "swath" which was our individual portion in which we were to remove all the ripe fruit, leaving the green ones to ripen for another day. And we were cautioned not to step on the plants as this would likely damage them from producing again. Dad had told us that we would get paid for helping him with this task. We were allowed to pick one green berry for each gallon bucket we filled and he warned us that he knew our capacity for picking and he would know if we cheated. In one day, if we picked well and fast, we could make a dollar for picking ten gallons of berries, That was a lot of money for us in those days. We felt rich! We didn't think about how long it took for use to make that much money but just having the money was joy beyond compare. When we had filled one of the buckets we could pour them into a larger container to be carried down the hill to where our home was. This would eliminate several trips up and down the hill. Eventually, my brother rigged up a pulley system from the house to the top of the hill so we could hang a bucket of berries onto the pulley and lower them down to the house by way of a handle. This sure saved a lot of steps and time for us. Word got around our community that we had strawberries for sale and people started placing orders with us. Whether it was only one gallon or a huge order of twenty to thirty gallons, we could always fill those orders. Dad would fill the gallon buckets heaping full until the berries were falling off the sides. Then he would transfer the berries over to the containers our customers had brought with them, all the while he would make sure the customer helped him count the gallons so as not to short them on their order. And when it was time for them to pay up, the price was always $1.00 a gallon. In all the years we kept that business going, he never changed the price. Word got around that Dad was very generous and fair and that made more business come our way. Eventually we got to the point of selling thousands of gallons of berries each season. Mom would never want the first berries in the spring. These were the ones that were bright red and huge. Just looking at them would make your mouth water. Most people would ask for those but not mom. She would always wait until the end of the season when the berries were smaller and a deeper red. Then she would ask for her share of the crop. These late berries had a sweeter taste. Sure, it took longer to clean and process them but it was well worth the effort. The jams and jellies she made from this fruit was the best and it was always a great treat to pull a box of sweetened berries from the freezer on a snowy winter day and taste summer sunshine. I think back on this now when I go out to buy strawberries for myself, might I say at a ridiculous price, and I try to choose the smalls berries in the bunch because I know they will taste the best. This business for us lasted about twenty years. By the time I graduated high school, there were no more children left at home to help Dad and his age had slowed him down. Eventually, he let the strawberry patch go but even after our crops had gone and we no longer kept it producing, we would get phone calls asking if we still had strawberries for sale. I guess Dad had a good idea after all. That business kept our family going for many years all for the price of a few plants, some fertilizer, and several strapping young kids capable of picking their share of red summer sunshine. Oh, the memories it brings for all of us. Thank you, Dad, for teaching us another lesson in life. I hope y'all enjoyed Jequeta's short story as much as I did. She couldn't have sent it to me at a more perfect time because I've had strawberries on my mind for the past month! I agree with Jequeta...they do taste like summer. If you missed my post last week and would like to make some jam with all of the strawberries that seems to be poppin' up, you can find my post and recipe for Strawberry Rhubarb Jam here. 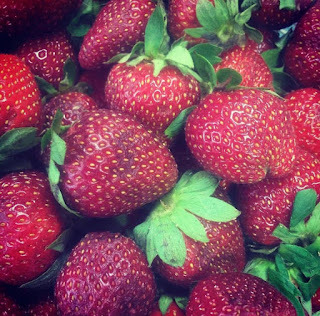 Does strawberries taste like summer to you too?